The society runs several minibus trips a year for members at a subsidised rate, often to wargame shows, but also to events such as Comiccon. 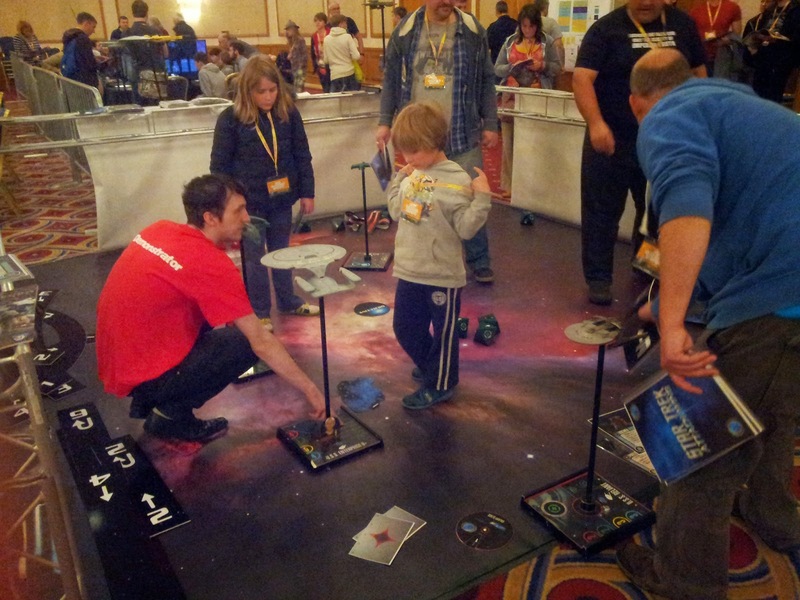 The previous weekend was our first trip to the UK Games Expo in Birmingham. We set off quite early and arrived in good time. The wait was no more than a minute or two to get in and the admissions team were friendly and helpful. Upon entering we were presented with a 50 page, glossy expo guide containing well written articles and interviews as well as the essential map and exhibitor listings. Despite the small queue the venue was already packed out. Describing it as their busiest show yet would be an understatement. 6000 people turned up to play, buy and meet designers and artists. That's not far from doubling last years turnout. We went on the Saturday, and the peak in attendance meant lots of queueing for things like the food court or the coffee shop - the queue was so big I skipped the Bring & Buy entirely. Once inside we split off in different directions and explored the vast selection of activities provided. After a cursory examination of the playtest games available and a chat with a few designers, I made my way to the open gaming area to play some pickup games. I tried a couple of games I'd never heard of before, and one I found that would be ideal for the society collection is the Spaghetti Western themed Bang!. The mechanics of Bang! are quite simple - each player has a role: Sheriff, Deputy, Outlaw or Renegade. The Outlaws need to take out the Sheriff, while his Deputy's need to keep him alive. The Renegade is a lonely third faction who has to outlive both sides. The kicker? The only player who reveals their role is the Sheriff. Through a mixture of bluffing and deduction you need to work out who your allies are. 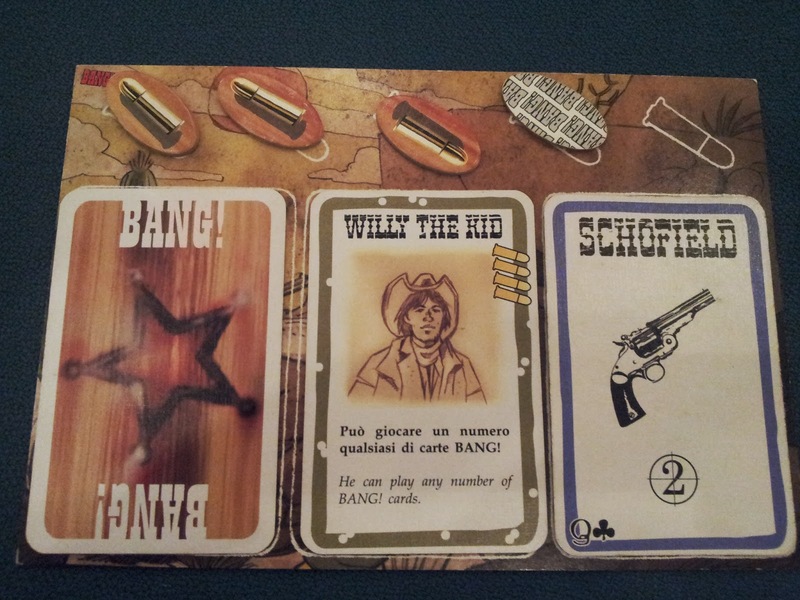 Each player gets a role, character, gun and a handful of other cards to use like dynamite and horses. Dynamite is lit and passed to the next player each turn, whether it blows when you have it is a case of hoping the next drawn card falls in your favour. Horses are used to increase the distance between you and other players, helping you stay out of range of enemy bullets. Your gun card has a number on it - this is the weapons range and is measured physically. This means my Schofield could shoot any player up to 2 seats to the left or right of me. As luck would have it, I was an Outlaw and the Sheriff was 3 seats away! Willy the Kid let me play unlimited Bang! cards. They act as bullets and are consumed as you shoot at your opponents. Despite feeling optimistic at the start with Billy and a handful of Bang! cards, one of the Deputy's took me out. Overall it was a thrilling game of wanton violence and shifty eye staring! Moving on to the trading halls, the sheer amount of industry names was breathtaking. 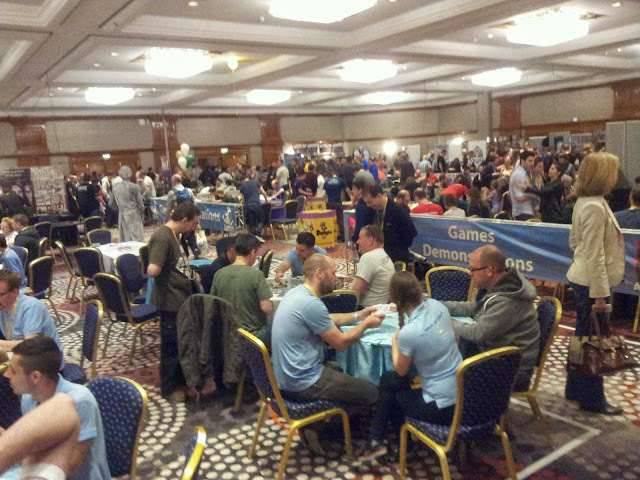 Chessex, Leisure Games, Cubicle 7, Queen Games, Esdevium, Steve Jackson Games and Mayfair were just a few of the heavyweights to put on a large presence at the expo. I spotted a few interesting looking games that have passed me by this past year, including Cornish Smuggler by Grublin Games Publishing, and 1944 Race to the Rhine by Phalanx Games. I went with the intention of not opening my wallet since the War Torn show is due in just a few weeks. As to be expected, I slipped up a couple of times but still managed to spend under £20. My old dice bag was literally falling apart at the seams, so a new one was an essential purchase. 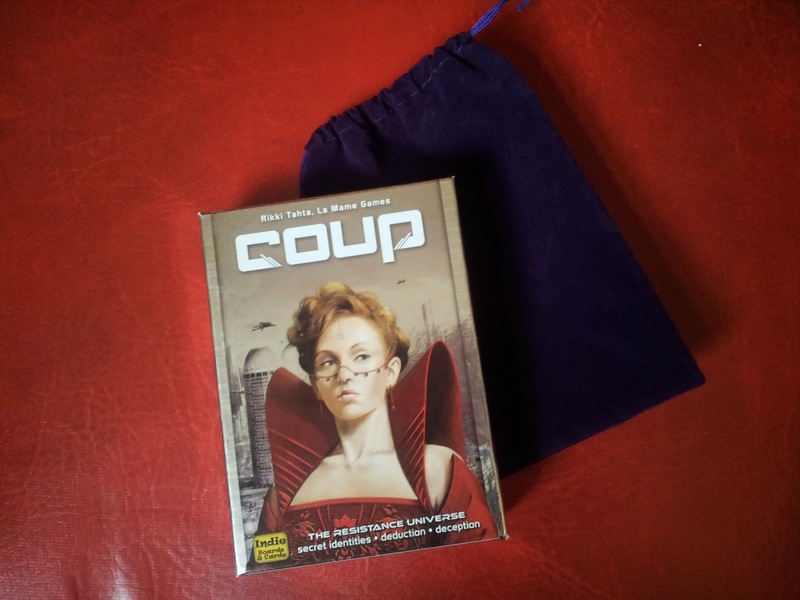 After many hours of playing The Resistance, I could not stop myself buying the faster paced, yet equally excellent Coup. Where Resistance plays in groups of 5-10, Coup is designed for 2-6 players. Instead of working in teams each player only operates in their own interest, to be the last one with influence in Court. Each player is given 2 characters which are kept secret. Every turn you can do one action, such as take money or use your characters special ability. Since you do not reveal your character, you can bluff and claim to have any character of your choice. If an opponent doesn't believe you, they may challenge you. At this point, you either lose a character (influence) and admit you were wrong, or reveal your character which forces them to lose one instead. Most characters have a counteraction which stops another characters abilities too. Lose both characters and you are out! Finally, I can't sign off without a mention of the seminars held over the weekend. Several well known faces were there as guest speakers, including Dr Quentin Cooper, Reiner Knizia, Christian Petersen, Matt Leacock and Monte Cook. Subjects varied from self publishing to the science of board games. 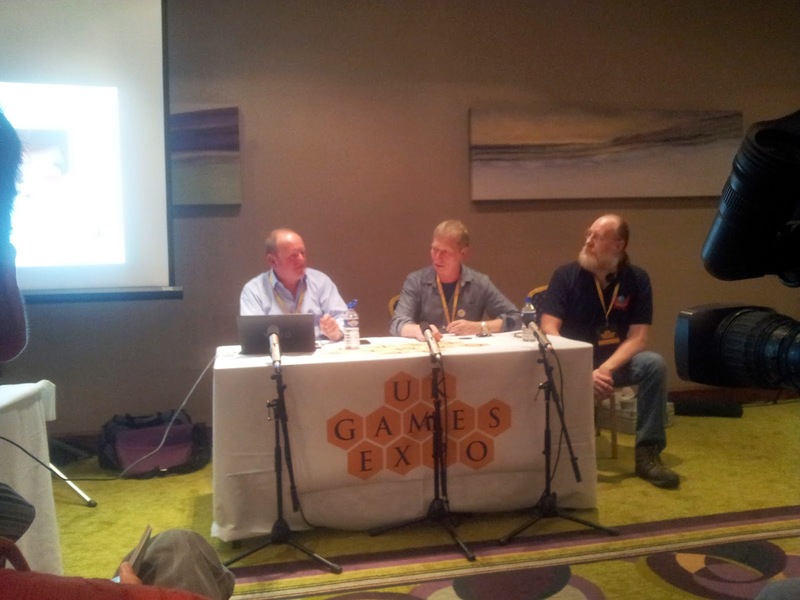 I sat in for the seminar called "Games Workshop: The Early Years" ran by Steve Jackson and Ian Livingstone, founders of Games Workshop and the massively popular Fighting Fantasy books. It was both fun and informative, and a real eye opener into the early days of the UK games industry and how much it has changed. They once lived in a van as they couldn't afford a shop and a home! If you are interested in attending next year I'm confident the society will be running another minibus. In the meantime, we are planning a trip to Comiccon Manchester in a month so grab yourself a ticket and enjoy one of the best geek shows in the North! More details will be on our forum and facebook soon. 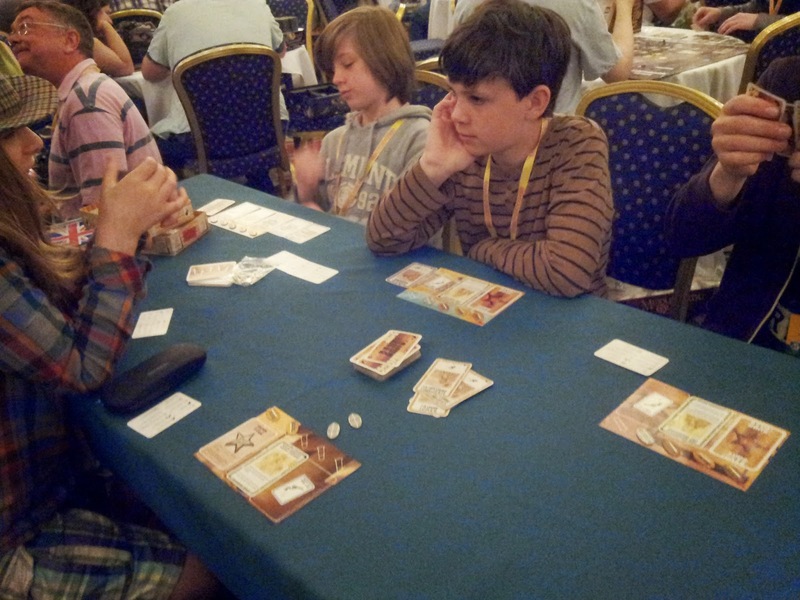 © Copyright 2014 Scarborough Games Society. Simple theme. Powered by Blogger.